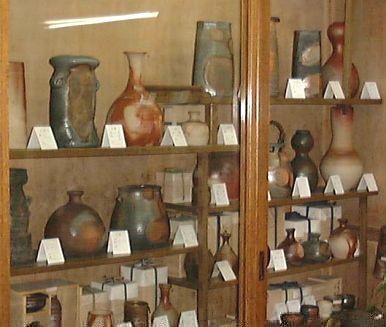 This is part two of our story on Bizen pottery. 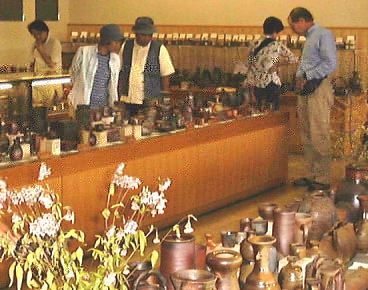 The first installment covers a Bizen Exhibition at the Okayama Prefectural Bizen Ceramic Museum (until November 4th, 2001). Click here to jump to part one. After enjoying all the pottery in the museum it's now time to walk the streets of Bizen. 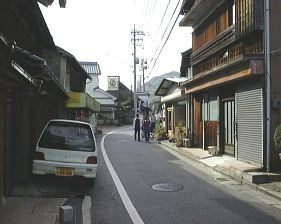 Bizen is one of the few potting towns where one can see much without the need of a car. Standing in front of the station one looks out to a small road that runs perpendicular to the larger main thoroughfare. 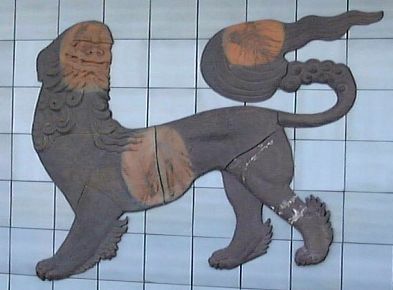 Before crossing that noisy intersection, let's take a look at the two relief figures of a shishi (mythical lion) on the station wall done by Urakami Zenji. One of the better shops awaits you on the left corner after crossing. 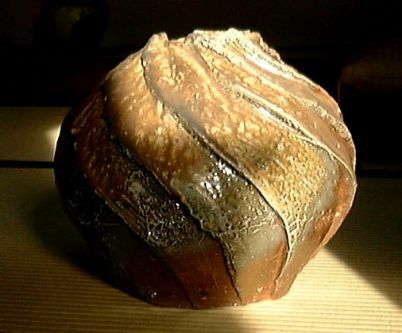 Featuring a wide selection of past greats and popular ceramists like Kakurezaki Ryuichi and Nakamura Rokuro, Gallery Omori is a shop to get an idea of what the price range is for Bizen pots. 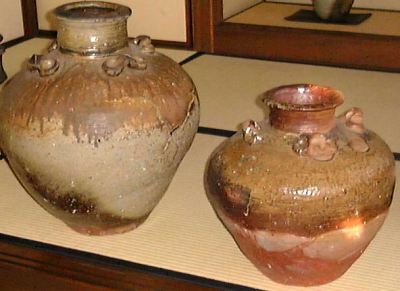 Below is a photo showing some of the works for sale at Omori. Remember though that in Bizen city prices can be higher than other parts of Japan. Local pride I guess. Shops line both sides of the road as one walks away from the station and the oldest shop is halfway up the street on the right. 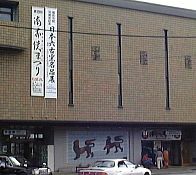 Bizen Togei Club was established in 1925 and carries Ko-Bizen (old Bizen) as well. Again, prices here are not cheap but they do offer hard to find items and the best of modern and contemporary works. Below is a photo of the shop. If you're looking for bargains, there are plenty of souvenir stores and I suggest just popping into whatever place strikes your fancy. 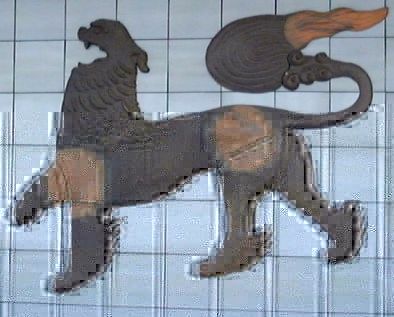 Be forewarned that many of the shops sell what I refer to as "plastic Bizen" and in particular the hidasuki "fire cord" pieces that are fired by the hundreds in gas kilns. 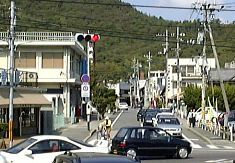 The road comes to a T-crossing with the Kimura Ichiyo kiln shop right in front. 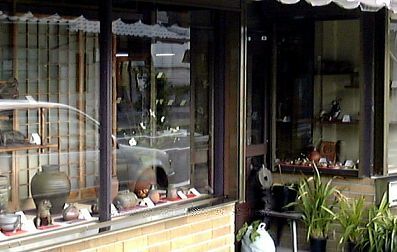 The Kimura family is one of the "six families of Bizen" and there are about five different Kimura production kilns and shops on this road. This road is the old main route that went through Bizen and it's quite narrow. Either way you turn you'll find shops. The Kimura Korakuen and Konishi Toko kilns are down the right side and the Mori Tozan and Ogawa Shuzo kilns are down the left. There many other shops on this street as well. Also, look out for the thatched roof house on the left (below photo). 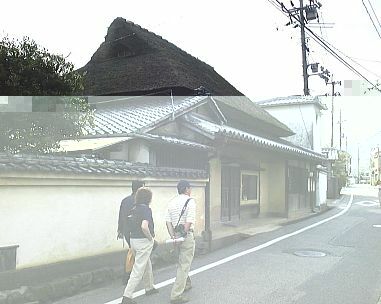 This (above and below photo) is the famous Kaneshige home where Rosanjin and Isamu Noguchi came in the 1950s. It is not a home where one can just knock on the door and expect to be welcome. If you'd like to visit be sure to call ahead of time. That holds true for almost all private studios. 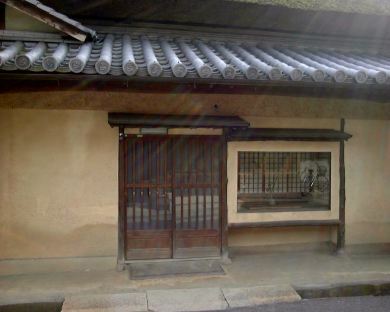 One traditional studio usually open to the public set in a thatched roof house is that of Isezaki Mitsuru and you'll find that right past the small river. Between homes on this narrow street there are small alleys. Do explore them for you'll come across interesting pottery walls, old kiln sites, and many shards when you get to the hills behind the homes. Back at the station there is a large room on the second floor that sells hundreds of pots. Just in case you couldn't find anything in town you might be able to locate something here. While I was in Bizen recently I visited the studios of Harada Shuroku and Abe Anjin. 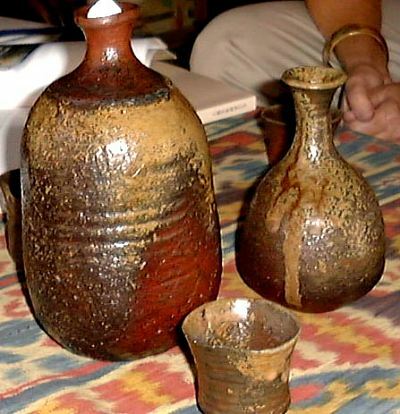 Both are among my favorite Bizen potters and here are some shots of their works. Three powerful tsubo by Harada and three sake utensils from Abe; both have excellent tsuchi-aji ('clay flavor') and thoughtful forms.  To visit Bizen City's own web site, please click here.